Sixty-five-year-old actress Angelina Lo (盧宛茵) was recently recognized for her years of acting and was awarded the “Professional Actor Award” at the 2018 TVB Anniversary Awards. With decades of acting experience, Angelina once prioritized getting married over her career advancement. Although the marriage eventually ended in a divorce, Angelina shared how she picked herself up after the split. At the height of her career, Angelina’s parents warned that Angelina was too young to get married. However, Angelia didn’t heed her parents’ warning, got married at 22 years old and later gave birth to three children. After staying married for 12 years, Angelina eventually requested a divorce. Angelina felt that if two parties are suffering together, it was better to end the marriage and stop the pain. After the divorce, she returned to the small screen in the drama, Seasons <季節>. The divorce had taken a toll on her mental health but thankfully, Angelina had support from her co-star, late actress Tang Pik Wan (鄧碧雲). 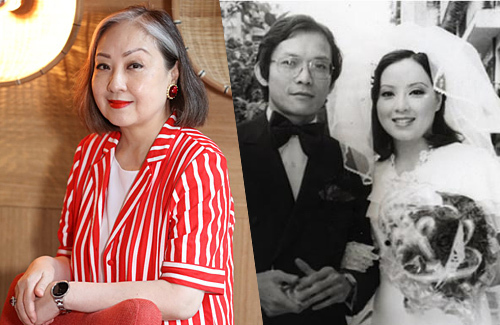 During their emotional talk, Tang Pik Wan told Angelina: “Stop always thinking of the past and stop missing the past.” Understanding that being nostalgic would only make her sad, Angelina started to look forward to the future. Today, Angelina is happy and independent. Although, Angelina didn’t have any boyfriends after her divorce, Angelina does not regret marrying at such a young age. If she didn’t marry, Angelina wouldn’t have her three children and four grandchildren today. True to her optimistic personality, Angelina joked that in the future she would want to wear a graduation hat and get an honorary degree, or get introduced to romantic suitors. However for now, Angelina enjoys being a grandmother, wishes for good health, and hopes to bring her career to greater heights. she is gorgeous in her young age, she still good looking for her age now. It’s nice to see news about a veteran like her. She is very practical. If I divorced my husband, while raising small children, I don’t think I would have any interest in dating either. Just because you marry early does not mean you will divorce as it depends on the person. Anyways, I watched her when she was young in ATV series and she was gorgeous. Glad she seems happy now in spite of getting a divorce. She has aged gracefully! You can still the young her in the current photo. It’s different from Carol Cheng who looks like a totally different person to when she was younger.